While the Sandy recovery effort continues to go on, we are also looking to transition this ministry, and the many skills and energies of our volunteers to continue their efforts, but on more local levels. 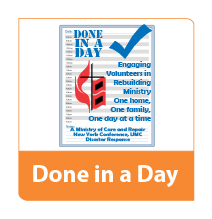 “Done in a Day” seeks to work with churches to identify local homes and homeowners who are in need, who may not be able to afford repairs, or who many need some TLC through home repairs. A priority should be given to low-income families, seniors, persons with disabilities, single-parent families, and others with special needs or circumstances. Local churches would provide the volunteer labor for the effort, and the Missions office will assist with funding. Click for the Funding Request form. For more information, or to establish a Done in a Day project through your church, please contact Tom Vencuss at tvencuss@nyac.com.